Ever felt disillusioned with a gaming franchise? Have your favourite series of games devolved into something mindless, something that doesn’t have a patch on the original? That’s a statement that could easily be applied to Resident Evil as of late. The sixth game was a mediocre mess that tried to do too much, neglecting the horror aspects entirely for an action approach. But do yourself a favour and check out Resident Evil Revelations, which is far, far better. And then prepare for the sequel. Moira Burton, daughter of the legendary Barry Burton, joins the main campaign. The campaign will be playable in co-op or singleplayer. Claire has a more combat focused style, whereas Moira supplies Claire with health herbs, flashlight and general support. Claire will be the only player death that will result in a Game Over screen, with Moira having to focus on keeping Claire alive. Claire can still heal herself, however. The story will take place on an abandoned island detention facility. The campaign will begin with Claire and Moira awakening after being abducted. The game takes place between the events of Resident Evil 5 and Resident Evil 6. 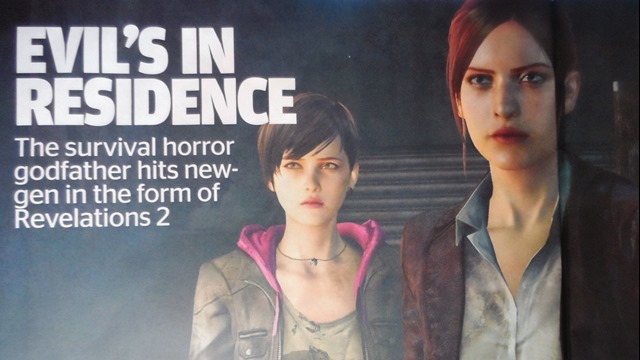 Much like the first Revelations game, Revelations 2 will focus far more on survival horror than over the top action, as was seen in Resident Evil 5 and 6. Afflicted enemies are both fast and able to deal heavy damage to the player. They can be taken head-on, snuck up on and taken down, or avoided completely so that players can preserve ammo. Resident Evil: Revelations 2 will run at 1080p and 60fps on PC and new-gen versions. Now that’s more like it Capcom. Combined with the upcoming Resident Evil HD remaster, it looks like this franchise is finally getting its act together.